Nissan Camper Has A Fully Stocked Workshop In The Back! What’s the first thing that you think about when you read the words ‘camper conversion’? Is it an off grid home, or a tiny house that you might take out for a spin on weekends? Perhaps it’s a retro Volkswagen Bus Camper, or maybe it’s a rough and ready cheap camper that you put your heart and soul into. Whatever your preference, you’ll probably find your personal definition over on our Van Lifers and Weekend Warriors Facebook page, but you certainly won’t find this Nissan Camper. 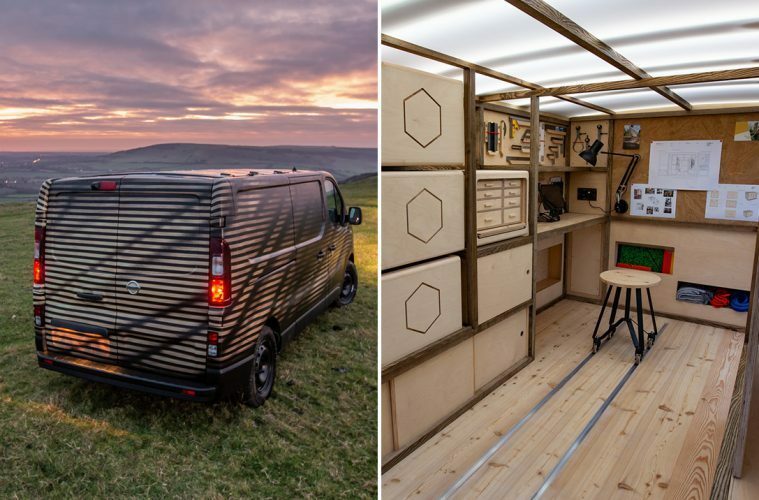 We’ve found the perfect van for all of you creative types out there; from master artisans to the DIY have-a-go-hero, this Nissan Camper Conversion has everything that you need to take your skills out of the workshop and into the wild. And what better place to build and carve than the very place that your materials come from; the great outdoors. So without further ado, let’s take a look at this tidy conversion and prove once and for all that being a digital nomad isn’t the only way to make money on the road. Build On The Go With This Incredible Nissan Camper Workshop Conversion! While this Nissan Camper conversion might not be an off-road adventure bus, it’s certainly turning a few heads in the off grid world. It might have initially been built to showcase Nissan’s all-electric portable power pack for the builder on the move, but the Nissan NV300 could well be the most cleverly planned out work van that we’ve ever come across. What’s Inside This Nissan Camper? 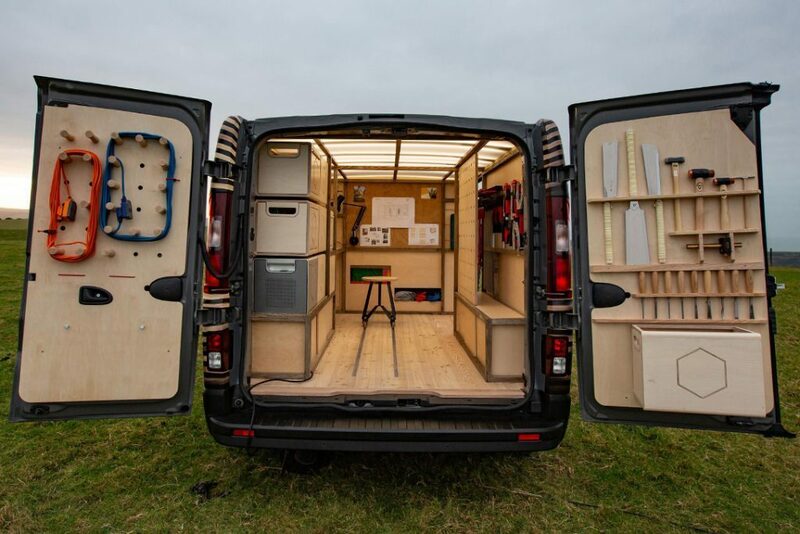 Open the back doors, and you’ll find a fully stocked mobile workshop. Now we don’t just mean that you’ll see a single wonky shelf and a couple of dodgy looking tools in there; we’re talking about the real deal. There’s so much storage space that you could store all of your spanners in height and weight order, and like getting your hands dirty, then you’ll feel like it’s Christmas morning when you see the plethora of power and hand tools that come with this Nissan Camper. 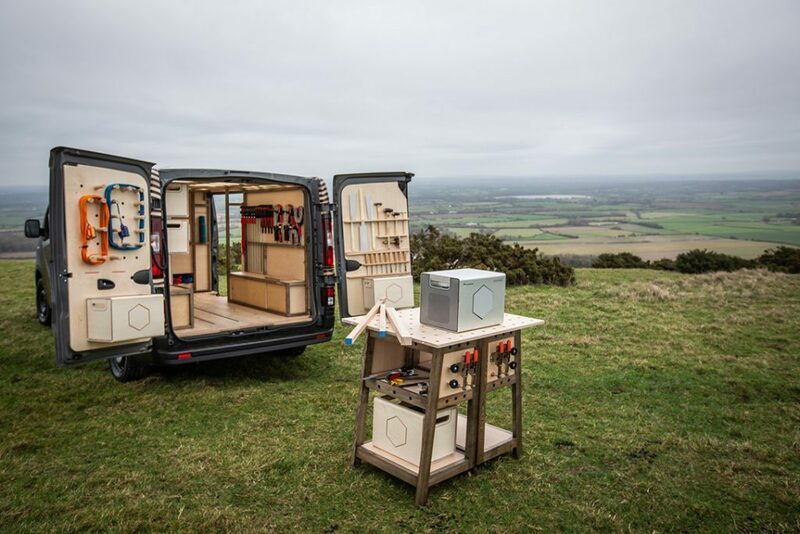 It even comes with a removable bench that can be erected outside of the van, in case you’re working on a long bit of wood or perhaps just want to get out into the sun! From the cable pegs and satisfying tool storage on the back doors to the cleverly built half units in the van itself, the design of this Nissan Camper has been well thought out and has pretty much everything that you could think of inside, no matter whether you’re a novice or a fully fledged Viking boat builder. Tell Us About The Gadgets! If you’re looking for a camper that has all of the bells and whistles of a power-hungry monster like the EarthRoamer, then this won’t be for you. But if your one of our vandwellers that likes driving top eco campers, then the Energy Roam power pack will be right up your street. It’s portable, can withstand any weather, and provides emission-free, silent power in any location that you park up in. It can store 700WH of electrical juice and has a maximum power output of 1KW, which is more than enough to power your jigsaws and electrical sanders etc. 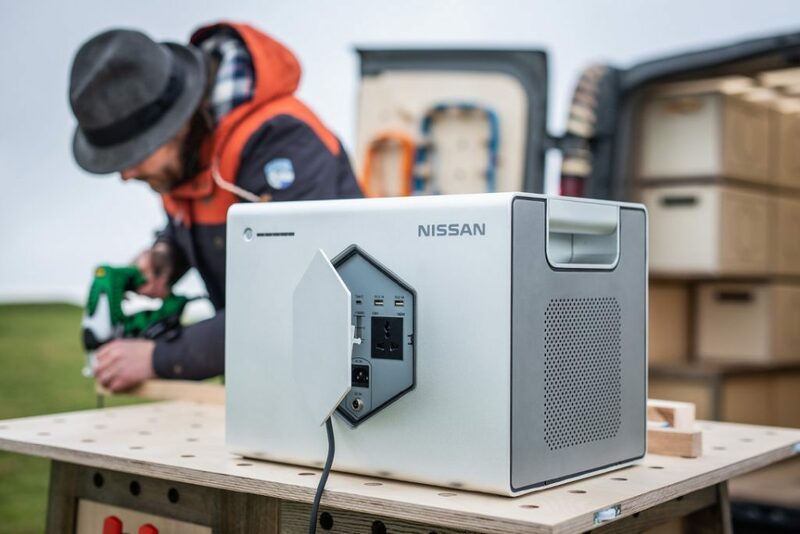 The Nissan Camper gets even greener too; the Energy ROAM power pack actually uses second-hand batteries from Nissan Leaf vehicles, giving them a new lease of life in the process. 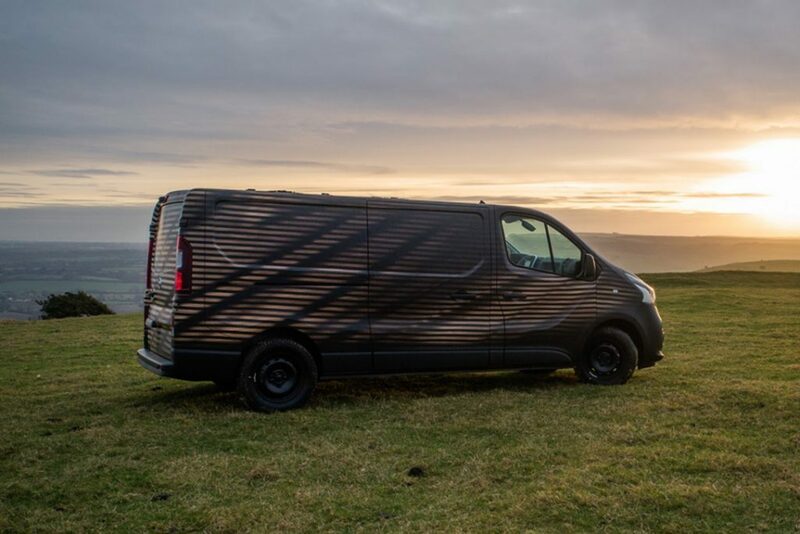 If you’re an artist or a sculptor who also has an electric campervan, then this could be the perfect vehicle for your off grid business! The Nissan Camper concept also features a pretty nifty looking integrated touch-screen computer, which could be great for mocking up your designs on the go and working from CAD drawings. The swivel seating on the floor rails makes for a comfortable place to sit and carve out intricate patterns, and the LED lighting in the ceiling means that you can be the one that decides when you stop working and not the sun! If you are a creative professional and wish that you could take your trade on the road with you, then this Nissan Camper could be the van that makes all of your dreams come true. It’s small enough not to be a nuisance getting to and from park-up spots, but it’s also big enough inside to hold all of your tools and more. It doesn’t just have to be for woodworkers or sculptors though; you could be a guitar builder or an artist, or maybe even an architect or builder who spends a lot of time on site to travelling between jobs. I like the thought that’s gone into building this Nissan Camper, and I hope that this concept doesn’t suddenly get stored away in one of those neat little boxes never to be seen again. With the wanderlust movement sweeping everyone off their feet, we’re seeing more and more sole traders and business owners taking their trade on the road and selling their products to customers all over the world. This Nissan Camper could open the door to a whole new world of possibilities, and if it doesn’t, then you can just nip into the back and make your own door instead. More Content From The Van Clan Team. Want to go where no eco camper has gone before? Try this Bicycle Camper out for size! Looking to build your own conversion? These Van Life Instagram accounts should give you some inspiration. Are you thinking of buying a ready-made camper? Check out these Top Campervan Conversions. Check out the Nissan website for more information on this crafty Nissan Camper!